You've probably heard that birds evolved from dinosaurs, but it's sometimes hard to understand exactly how that could have happened. Especially the flying part. How does an animal that can't fly evolve to do so? It's not like you can take baby steps towards flying; you either can do it or you can't. Except, maybe that's not so true. Here's the story of how birds first took to the sky. Archaeopteryx lithographica, specimen displayed at the Museum für Naturkunde in Berlin. If you're picturing a six-ton triceratops sprouting little wings, the idea that birds evolved from dinosaurs might sound a little fishy. But when you look at the skeletons of small theropods and the skeletons of modern chickens, it makes a little more sense. The most famous proto-bird is probably archaeopteryx, a raven-sized animal that single-handedly demonstrated the link between the two lineages. With its flight-ready wings, full-body plumage, razor-sharp teeth, and long, scaly tail, it's pretty much the perfect blend of dino and bird — so much so that some people aren't sure which one it is. The real answer is probably that it's a little bit of both, or even that every bird is a dinosaur. But all that doesn't really answer the question of where archaeopteryx came from. Archaeopteryx seemed to emerge from the fossil record complete with a number of bird-like features, so scientists used to categorize it as a "hopeful monster" — an animal born with major mutations that just so happened to work out well together, in this case, both feathers and wings. But we now know that many dinosaurs had feathers, even big carnivores like yutyrannus. For those dinos, feathers would have been primarily for insulation. Once you've got feathers, bird wings are easy to develop, and the earliest ones took many forms. Just check out the four wings on microraptor. But even before tiny raptors began flying, they likely used small, wing-like limbs for a little extra lift when jumping and for something called wing-assisted incline running, which modern birds still use to get away from predators by speeding up steep inclines. So it wasn't such a hopeful monster after all, just a series of gradual improvements that led to gliding, which eventually turned into full-fledged flight. So that's how dinosaurs started flying. Does it surprise you to learn that pterodactyls don't have anything to do with it? Here's something that might blow your mind even more: pterodactyls aren't even dinosaurs. Leaving that tidbit aside, flight has actually evolved at least three separate times among vertebrates, and there are a few critters that already seem like they might be on their way up as well. The OG fliers. For 140 million years, pterosaurs were pretty much unchallenged in the skies (though birds may have started turning up towards the end). Their wings took the form of a membrane stretched back from their "pinky finger" to their body, with the rest of their digits extending forward from the wing's central joint. They likely walked on their knuckles, like a gorilla, and would have taken off from the ground instead of launching themselves from trees. 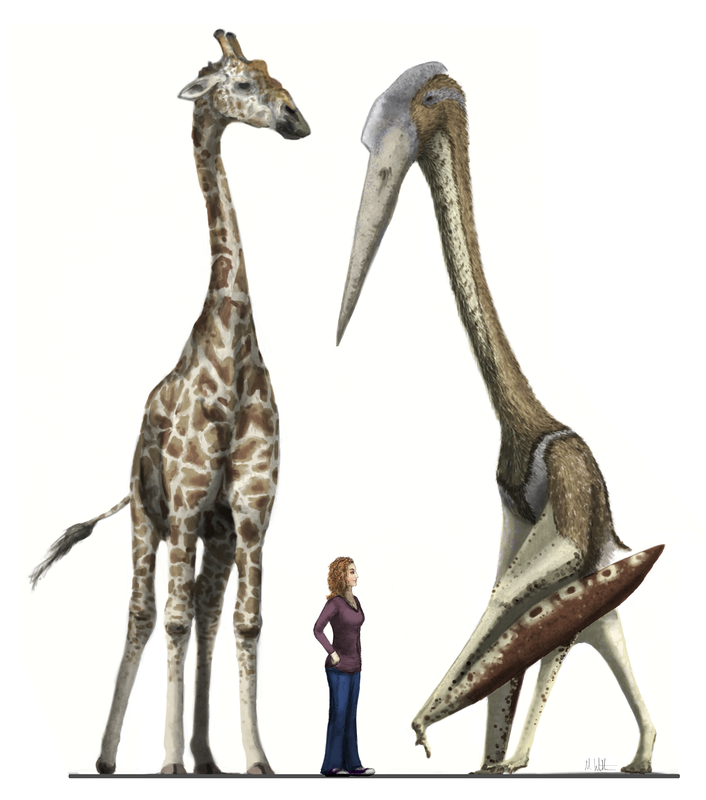 Though the most famous pterosaur, pterodactyl, had a wingspan of only 3 feet, these things got huge — quetzelcoatlus was as tall as a giraffe. We've covered them pretty well already, so we don't need to go into too much detail. Unlike pterosaurs, birds have wings built around a fused hand, with relatively thick but hollow bones providing their structure. This likely allows birds a greater degree of maneuverability than pterosaurs would have enjoyed, since their wings aren't restricted due to being attached to the body by a membrane. At first glance, bat wings look similar to those of pterosaurs, with a membrane stretching from the tip back to their body (or even their toes). The main difference is that their hand is turned inward, with each finger extending through the membrane to give it more structure. They only started flying about 50 million years ago, meaning they are still the new kids on the aerial block. There are a few up-and-comers on their heels, however. There are a few vertebrates that can't quite fly yet, but they can glide. Basically, that means that their wings can't take them up, but they can fall slower and move while they do it. Flying squirrels are probably the most famous example, and not just because of their symbiotic relationship with mooses. But there are tons of others, and they're not just mammals. We already told you about flying snakes, which slither their way through the air like it's solid ground. There are also gliding frogs, which use their webbed feet as parachutes, and flying fish and flying rays represent the aquatic set. Who knows? In a couple million years, the skies might be full of flying animals from every kingdom.